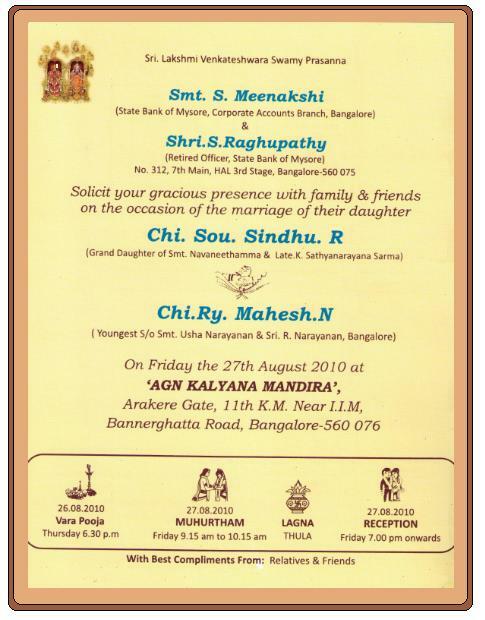 My Cousin Meenakshi's (alias Jayanthy) daughter Sindhu is married to N Mahesh, son of Shri R Narayanan, at Bengaluru AGN Kalyana Mandira on 27th August 2010. Sindhu is the only daughter of my cousin Meenakshi and her husband Shri S. Raghupathy. Sindhu is also talented in Indian music and has also released some albums. Congratulations to Sindhu and Mahesh and we wish them a very long and happy married life.